Hartshead's George Saville delivers against Gomersal. 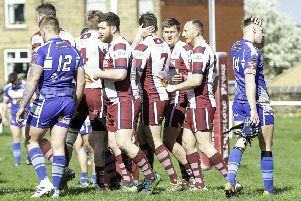 Scholes require just three more points to secure promotion to Bradford League Division One alongside Morley. The Scatcherd Lane side are assured of an immediate return to the top flight after none of Sunday’s games finished. Scholes began the weekend with a nine-wicket win over Windhill, who were dismissed for 62 as captain James Stansfield claimed 5-21. Stansfield’s side were also on course for victory on Sudnay when they dismissed Bowling Old Lane for 65, with Joe Duffy (3-12) and Yasir Ali (3-19) doing the damage. Scholes were 45-1 in reply when the heavens opened to end their hopes of victory. Morley earned a 123-run victory over Idle on Saturday before sitting out Sunday’s round of matches. They lead Scholes by 16 points with a game in hand as they look to clinch the Division Two title. Gomersal’s Adam Greenwood top scored with 69 to steer his side to 199 all out in last Saturday’s derby against Hartshead Moor, who had Andrew Parratt (3-52) in form with the ball. Hartshead reached 80-5 in reply, with Fawad Ul Haq (45) top scoring before rain stopped play. Ul-Haq hit a splendid 103 not out on Sunday as Hartshead posted 222-9 to end Baildon’s promotion hopes before the rain washed out the reply. Baildon’s hopes were severly dented by a 117-run defeat to Spen Victoria last Saturday. Spen hit 188-7 as Zarak Khan (37) top scored before Adil Islam (3-14), Abid Awan (3-16) and Abbas Ahmed (3-15) struck as Baildon were all out for 71.